You can always rely on the brilliant Melissa & Doug to be at the forefront of children's product innovation, and in our view this awesome Big Rig Building Set is a toy bordering on genius in its creativity and invention. A tough two piece free rolling tractor-trailer, the truck itself is actually a moving building site! Packed with wooden building pieces and pre-drilled with holes for the nails and bolts, the Big Rig Building Set includes 22 wooden pieces - including a hammer, screwdriver, wrench, board, nails, nuts, and bolts. Little ones can connect the building boards using the tools included to create brightly coloured structures on the move! Then, after a hard day's work and with the job all done, just store away your equipment inside your incredible toolbox on wheels! This is a really unique toy, with multi-layered play value, that is going to have a big grin on any little builders face very quickly! It's a really strurdy, well put together an totally child safe toy, with great wooden pieces and a stunning visual, that will look great on any bedroom shelf. 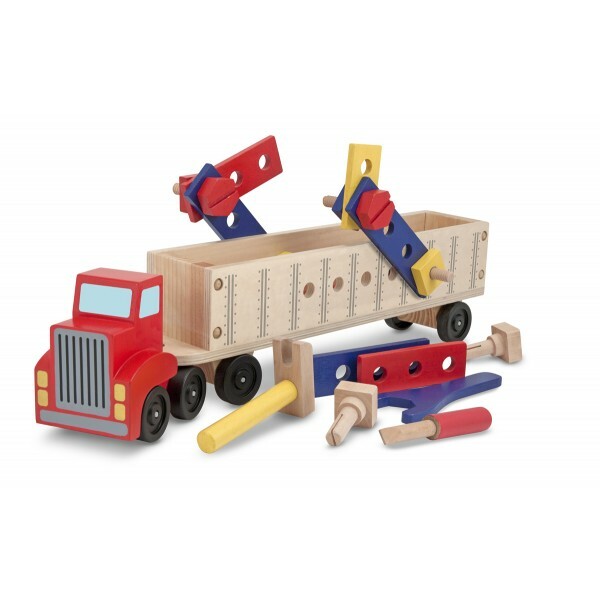 Big Rig Building Set is great for developing hand-eye co-ordination and problem solving skills, and it encourages imaginative play and manual dexterity.